When the FBI informs us that parents are ready to spend up to $6.5 million in bribes to get their children into prestige colleges, it seemingly implies that all is very, very well in the American university. But Warren Treadgold tells us that's an illusion. He's a distinguished professor of Byzantine history at St. Louis University who has also taught at Berkeley, FIU, Hillsdale, Stanford, and UCLA. 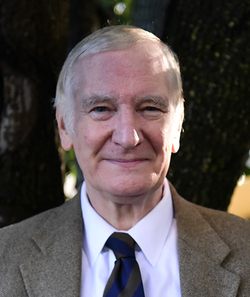 Having entered college in 1967, he draws on long experience to both indict and offer a remedy of the most thoroughly left-wing major institution in America. His book, The University We Need (Encounter, 2018) presents its case with insight and a light touch. Treadgold reports a deep rot: Faculty search committees routinely screen out the most capable candidates, fearing to be shown up by them; he even suggests that they would turn down Albert Einstein. Instead, they usually favor "only black, Hispanic, and female applicants who hold the sorts of views that the universities approve." Not surprisingly, graduate students prepare obscure, jargon-laded theses, hoping to win the favor of lazy search committees with their "few fashionable publications." Professors bribe students with high grades to win positive evaluations from them. Administrators (i.e., "professors uninterested in teaching and research") have doubled in number over recent decades. 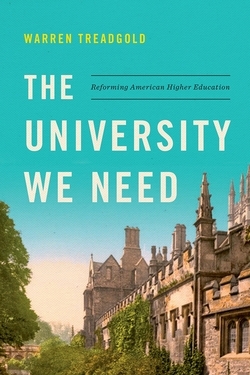 "The University We Need" cover. Worse yet is the ideological groupthink: "The dominant opinion considers fighting racism, sexism, and other forms of oppression to be so vital that it supersedes everything else" – including serious scholarship and proper teaching of the young (resulting in "mediocre courses on unrelated subjects"). Leftist dogma – an insistence on judging the past by today's standards, celebrating allegedly oppressed groups, replacing facts with "narratives," and prostrating before "social justice" – reigns at nearly all institutions of higher learning. All this matters, Treadgold argues, because what begins at the university spreads to the country as a whole; just look at the U.S. Court of Appeals for the Ninth Circuit or the radical Democrats in the House of Representatives. Indeed, "We need good universities in the same way that we need reliable electricity and safe drinking water." This new university will feature real debate, not safe zones; temporary, not permanent administrators; excellence, not conformity; diversity of ideas, not of skin color; general education, not idiosyncratic courses ("Mummies, Zombies, and Vampires" anyone? ); study tours abroad, not foreign campuses; strong departments, not interdisciplinary studies; and true scholarship, not postmodern claptrap. 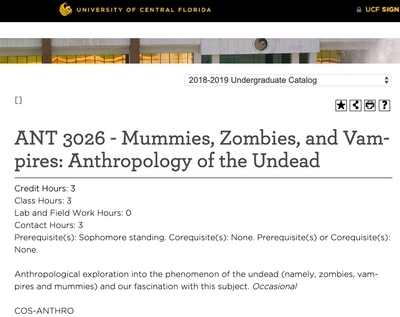 The UCF course description of "Mummies, Zombies, and Vampires." Treadgold's vision even includes the smallest specifics: "Narrow beds" at his planned campus "should help discourage overnight stays." He proposes a location 25 miles outside of Washington, D.C., accessible to the corridors of power without being overwhelmed by them. Of particular interest, he calls for a focus on topics that other universities avoid as too controversial, such as "climate engineering, the consequences of family breakdown, and the philosophical inconsistencies of collective guilt." He predicts this newcomer will challenge the staid world of elite universities, upset the status quo, and create a new standard of quality. In a separate analysis, Frederick M. Hess and Brendan Bell do the math and conclude that such a university would cost $3.4 billion to build and endow in perpetuity. That's a tidy sum but donors in 2017 gave $43.6 billion to higher education. $3.4 billion is also but a fraction of some conservatives' vast wealth (hello Charles and David, hello Sheldon, hello Rupert). Alone or in combination, they could, in the grand nineteenth-century style, fund the title's "university we need." 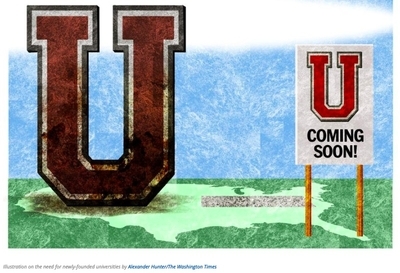 If this plan dramatically breaks with precedent – not a single major private research university has been founded in over a century – its potential impact might inspire an opening of wallets. "Nothing else any donor can do today," Treadgold maintains, "could have nearly the long-term social, cultural, or political impact of helping to finance a new leading university." But it must happen soon, for time is running out; the scholars who would staff this institution are retiring or dying off, and not being replaced. The University of Chicago, founded 1890. The University We Need is a tour de force that seeks to continue the magnificent American tradition of higher education. But will it find an audience? More specifically, will conservative billionaires respond to Treadgold's clarion call?